This adds two blocks for extracting from the side of blocks, analog to the hopper extracting from the top. Both blocks will eject items into the world, where they can be caught with a hopper or other. Dung Pipes are made from wood and pull from the block they're attached to. 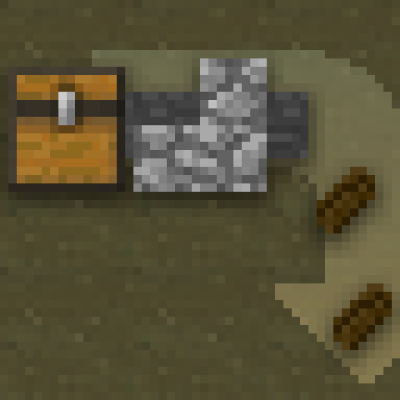 Sewer Pipes are extended with iron, and can not only pull from the block they're attached to, but also the block behind that one, but only if they're attached to the solid side of a block. A pipe will visually extend through the offending block to show that it will pull from the block behind. Neither pipes respond to redstone signals, but Sewer Pipes can be disabled by moving the intermediate block with a piston or similar. No, but I was having fun and I was imagining a pipe on an outhouse depositing... well... into a through for the pigs. Similarly sewerpipe, because it goes through walls and dumps sewage out. I think dung pipe is a very fitting name. Now we need just a poop mod.